Continuing Anglican churches have generally been formed by clergy and lay people who left churches belonging to the Anglican Communion. These particular Anglican Communion churches are charged by the Continuing movement with being greatly compromised by adopting what they consider to be secular cultural standards and liberal approaches to theology. Many Continuing Anglicans believe that the faith of some churches in communion with the Archbishop of Canterbury has become either unorthodox or un-Christian and therefore have not sought to also be in communion with them. Although the term Anglican refers also to those churches in communion with the Church of England and the Archbishop of Canterbury, many Continuing churches, particularly those in the United States, use the term Anglican to differentiate themselves from the Episcopal Church. Many continuing Anglicans feel that they are remaining true to historic Anglican tradition and Biblical Christianity and that it is the Episcopal Church in the United States, as well as other parts of the Anglican Communion, which have become unorthodox. Anglicanism in general has always sought a balance between the emphases of Catholicism and Protestantism, while tolerating a range of expressions of evangelicalism and ceremony. 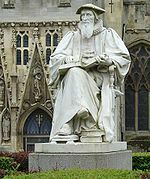 Clergy and laity from all Anglican churchmanship traditions have been active in the formation of the Continuing Anglican movement. There are high church, broad church, and low church Continuing Anglicans. Many are Anglo-Catholic, such as the ACC and the APA with highly ceremonial liturgical practices. Others which belong to a more Evangelical tradition, such as the UECNA, support the Thirty-Nine Articles and often alternate Morning Prayer with Holy Communion. The Continuing churches in the United States reject the 1979 revision of the Book of Common Prayer made by the Episcopal Church and use the 1928 version or prior official versions of the Book of Common Prayer for their services instead. In addition, some Anglo-Catholic bodies also use the Anglican Missal or English Missal in celebrating the Eucharist. Liturgical use of the 1611 Authorized Version of the Bible (known in the United States as the King James Version) is also a common feature. This is done for many reasons, including aesthetics, and in opposition to the liberal or progressive theology that updated English translations such as the New Revised Standard Version embody. The Continuing Anglican movement originated in the Episcopal Church in the United States of America and the Anglican Church of Canada. Related churches in other countries, such as the Anglican Catholic Church in Australia and the Church of England (Continuing), were founded later. In 1976, the General Convention of the Episcopal Church in the United States of America voted to approve the ordination of women to the priesthood and to the episcopate and also provisionally adopted a new and doctrinally controversial Book of Common Prayer, later called the 1979 version. During the following year, 1977, several thousand dissenting clergy and laypersons responded to those actions by meeting in St. Louis, Missouri under the auspices of the Fellowship of Concerned Churchmen and adopted a theological statement, the Affirmation of St. Louis. The Affirmation expressed a determination "to continue in the Catholic Faith, Apostolic Order, Orthodox Worship and Evangelical Witness of the traditional Anglican Church, doing all things necessary for the continuance of the same." Out of this meeting came a new church with the provisional name of the "Anglican Church in North America (Episcopal)". The first bishop of the new church, Charles Doren, was consecrated by a retired bishop of the Episcopal Church, Albert A. Chambers of the Diocese of Springfield, Illinois, with Francisco Pagtakhan of the Philippine Independent Church as co-consecrator. Although expected to be the third bishop participating in Doren's consecration, Mark Pae of the Anglican Church of Korea sent a letter of consent instead. This development left the new group open to charges of violating the customs of apostolic succession, in which three bishops customarily are present. The newly consecrated Doren then joined with Chambers and Pagtakhan in consecrating as bishops James Orin Mote, Robert S. Morse, and Francis Watterson. Watterson left the movement shortly afterward and became a Roman Catholic priest. During the process of ratifying the new church's constitution, disputes developed which split its dioceses into two American churches and a separate Canadian church. These were the Anglican Catholic Church led by Mote, the Diocese of Christ the King (now the Anglican Province of Christ the King) led by Morse, and the Anglican Catholic Church of Canada. In 1981, Doren and others left the Anglican Catholic Church to found the United Episcopal Church of North America in opposition to the alleged inhospitality of the other jurisdictions towards low churchmen. The original generation of Continuing Anglican parishes in North America were located mainly in metropolitan areas. Since the late 1990s, a number have appeared in smaller communities, often as a result of a division in the town's existing Episcopal parish(es) or mission(s). The 2007/08 Directory of Traditional Anglican and Episcopal Parishes, published by The Fellowship of Concerned Churchmen, contained information on over 900 parishes affiliated with either the Continuing Anglican churches or the Anglican realignment movement. The principles of the Affirmation of St. Louis and, to a lesser extent, the Thirty-nine Articles of Religion, provide some basis for unity in the movement, but the jurisdictions are numerous, usually quite small in membership and often splinter and recombine. Many church bodies of more recent origin have referred to themselves as "Continuing Anglican" although they have no connection to the Congress of St. Louis and do not adhere to all of its principles. Some reports put the number of such jurisdictions at more than forty, but fewer than a dozen of the churches popularly called "Continuing Anglican churches" can be traced back to the meeting in St. Louis. In 2007, various jurisdictions made attempts at overcoming the movement's divisions. The Anglican Catholic Church, the Anglican Province of Christ the King, and the United Episcopal Church of North America entered into discussions about possible organic unity. A Communion Agreement was entered into on May 17, 2007. In January 2009 one bishop from each jurisdiction consecrated three suffragan bishops in St. Louis, intending that they serve all three jurisdictions. The Anglican Episcopal Church and the Diocese of the Great Lakes formed the North American Anglican Conference for mutual assistance between "Biblical Anglican" churches. A suffragan bishop was consecrated for the Anglican Episcopal Church in late 2008 by its presiding bishop and three bishops of the Diocese of the Great Lakes. Both the Diocese of the Great Lakes, and the Anglican Episcopal Church have subsequently merged with the United Episcopal Church of North America. Another regional association facilitating increased dialogue and fellowship opportunities is Common Cause Appalachia, to which some continuing Anglican churches in Georgia, Kentucky, North Carolina and Tennessee belong. In 2007, one Continuing Anglican church body, the Traditional Anglican Communion (TAC), made a formal proposal to the Roman Catholic Church for admission into "full corporate and sacramental union" with that church in a manner that would permit the retention of some of its Anglican heritage. The Vatican announced, on July 5, 2008, that it was giving serious consideration to appeals received from various Anglican groups seeking union with itself, observing that "the situation within the Anglican Communion in general has become markedly more complex". On October 29, 2009, the Congregation for the Doctrine of the Faith announced Pope Benedict XVI's intention to create a new type of ecclesiastical structure, called a "personal ordinariate", for groups of Anglicans entering into full communion with the see of Rome. On November 4, 2009, Pope Benedict signed an apostolic constitution, Anglicanorum coetibus. The House of Bishops of the Anglican Church in America – the American Province of the TAC – responded on March 3, 2010, voting unanimously to request acceptance under the personal ordinariate provision. Within months, however, a majority of ACA bishops made known their opposition to the move and the church has since declared its intention to remain a Continuing Anglican body. On October 6, 2017, The Anglican Church in America, The Anglican Catholic Church, The Anglican Province of America, and the Diocese of the Holy Cross signed an agreement of full communion. The oldest independent Anglican churches are the Free Church of England (the first congregations of which were founded in 1844), the Reformed Episcopal Church (founded in 1873), and the Orthodox Anglican Church (founded in 1963). These churches are not universally considered to be Continuing Anglican churches because they were founded prior to the beginning of the Continuing Anglican movement of the 1970s; however, they relate to the Continuing churches on a number of levels and have similarities in beliefs and practices. The following is a list of church bodies commonly called "Continuing Anglican." The approximate number of their North American parishes is shown in parentheses. ^ "Anglicans Online - Churches not 'in the Communion'". Retrieved 5 March 2015. ^ Webster, Daniel J. (January 22, 2004). "What is 'To Be In Communion'?" ^ Plexus Web Creations. "Anglican Catholic". Retrieved 5 March 2015. ^ Hart, Fr. Robert (March 10, 2008). "Translations and Theology"
^ "Fellowship of Concerned Churchmen - Directory of Jurisdictions". Retrieved 5 March 2015. ^ "Fellowship of Concerned Churchmen". Retrieved 5 March 2015. ^ Hepworth, John. "Rome and the TAC"
^ "Pope Benedict approves structure for admitting large groups of Anglicans into Catholic Church". Catholic News Agency. Retrieved 22 October 2009. ^ "TAC Formally Requests Personal Ordinariate for USA". The Anglo-Catholic. 2010-03-03. Retrieved 2010-12-10. [...] the decision was made formally to request the implementation of the provisions of the Apostolic Constitution Anglicanorum cœtibus in the United States of America by the Congregation for the Doctrine of the Faith. ^ Weatherbe, Steve (March 14, 2010). "Anglo-Catholic Bishops Vote for Rome". National Catholic Register. Archived from the original on 2010-03-13. Retrieved 2010-03-08. The bishops voted to become part of the Roman Catholic Church along with 3,000 fellow communicants in more than 100 parishes in the United States. See also: Anglicanorum Coetibus#Anglican Church in America. ^ Virtue, David (October 1, 2010). "Viewpoints"
^ "Anglican Catholic Church press release". Dees, James P., Bp. Reformation Anglicanism: an address ... on the Occasion of the Dedication of Cranmer Seminary ... Sept. 19, 1971 ... of the Anglican Orthodox Church. Statesville, N.C.: Anglican Orthodox Church, 1971.  p., col. ill. The League of Independent Episcopal Parishes (LIEP), sponsored by the Traditional Episcopal Church. Spring Hill, Flor. : League of Independent Episcopal Churches, [199-]. N.B. : No personal author or specific committee is credited for the text of this pamphlet. The Traditional Episcopal Church. Spring Hill, Flor. : Traditional Episcopal Church, [199-]. N.B. : No personal author or specific committee is credited for the text of this pamphlet. List of churches not in the Anglican Communion, at anglicansonline.org. Includes weblinks for most of the Continuing Anglican churches and some other non-Anglican churches. The Measure of A Bishop: The Episcopi Vagantes, Apostolic Succession, and the Legitimacy of the Anglican "Continuing Church" Movement. A master's degree thesis, written by a student at Gordon-Conwell Theological Seminary, containing historical information on Continuing Anglican and related churches.